Detailed information on Sample Mounting and Sample types for SAXS may be found in the Pre Experiment Planning section of the Beamline Wiki. The SAXS/WAXS beamline can provide information on the structure of samples on length scales from approximately 0.1 to 500 nm. SAXS/WAXS is a powerful technique for nano-scale analysis of solid and liquid samples in many research fields. Detailed information about the types of samples that may be run on the beamline may be found in the Beamline wiki. In particular, the beamline facilitates SAXS/WAXS experiments that are not feasible using laboratory equipment. These include time-resolved, spatially-resolved and anomalous scattering (energy-resolved) analysis, grazing incidence scattering, very small specimens, and weakly scattering systems. 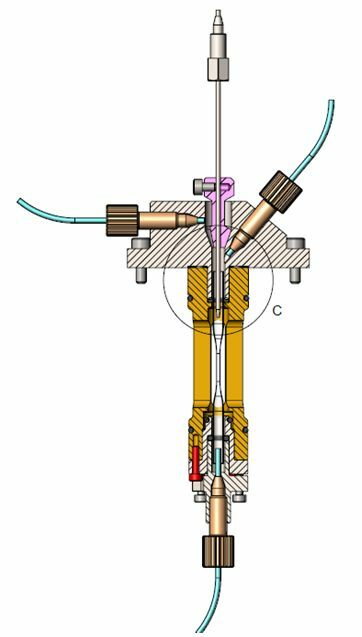 A high beam intensity and highly adaptable sample mounts make the beamline is particularly suitable for time resolved in-situ experiments or dilute and weakly scattering samples. Previous experiments have included observation of changing samples at over 10 frames per second and protein solutions of concentrations as low as 0.1 mg/mL. If you are unsure of the suitability of your sample, please contact Beamline staff. Proposals for beam time are required to specify details of sample mounting and environment in the experimental section. The requested sample environment and details of any additional equipment must also be stated in the Detailed Experiment Plan form submitted prior to an experiment. Beamline staff will attempt to accommodate all reasonable requests with regard to providing sample mounts and sample environments for the beamline. Many user-provided systems can be accommodated and the more communication with staff the better we can assist. For detailed information on sample mounts for the beamline, visit the Beamline Wiki. If you require further information, have any questions or would like to discuss a specific sample requirement, please contact beamline staff. Ensuring that you are able to run the samples in a timely and appropriate manner is key to a successful experiment and we request that you give this due consideration when preparing for an experiment. Sample mounting on the SAXS beamline uses a 3-axis stage rated to 500 kg with an optical breadboard as the top plate. This provides a flexible sample position that may be readily modified for mounting different sample holders and sample environments. The beamline can provide basic mounting for both solid and liquid samples although user mounting systems are preferred when available. The range of sample mounts readily available at the beamline is detailed below. Right: The sample position of the SAXS beamline. Sample alignment is performed using areaVision software (developed in-house). An on-axis sample viewing camera provides a direct, live view of the sample before, during and after exposure. Initially the beam position is established by viewing a scintillating crystal placed at the sample position. The beam position is marked with a cursor on the sample view and samples may then be aligned with the beam using the now fixed beam cursor as a reference. The camera can readily view samples of 10 micron size or greater. The sample stage has a precision of greater than 5 microns in all 3 axes, allowing careful sample alignment. Rapid, precise alignment is further facilitated by the point & click function of the areaVision software, which allows a desired sample position to be aligned with the beam cursor with a single mouse click. Additional, broader views of the sample position, sample mounts or samples themselves can be readily provided with Flea video cameras mounted and positioned as required. Remote webcams are also mounted in the beamline hutch to provide remote monitoring of the beamline, and may also be used to view samples and equipment. Discrete solid samples, i.e. not powders, may be mounted on a sample plate, similar to that pictured below, for more details please refer to the Beamline Wiki. Mounting samples on plates the day before an experiment is recommended where possible to allow efficient use of beam time. When in use, the sample plates are mounted on a vertical post attached to the breadboard of the sample stage with alignment and movement between samples performed with the X & Y motors of the sample stage. The fine precision of the motors on the sample stage allows fine alignment using the view provided by the on-axis camera. It is recommended to label a plate of samples so that a wide view of the sample position will help to indicate which sample is in position. Liquids, gels, solutions and powdered samples are typically run by filling 1.5 mm diameter quartz capillaries. Powders and gels may be loaded directly into capillaries that are then placed in sample holders on the beamline. Sample mounts are also available for capillaries that provide a range of experiment conditions. For static liquids a temperature controlled mount (0 - 80°C) can accommodate up to 40 capillaries (see below) with temperature control via a water bath connected to a brass block which is part of the sample holder. The sample holder may be positioned to allowed capillaries to be vertical or horizontal in the beam. For more details, please refer to the Beamline Wiki. Top view of mount showing slots for capillaries and brass block. Small volumes or weakly scattering solutions, e.g. proteins, may also be studied using a single, suspended capillary housed in a metal support mount and using a syringe pump to load and eject samples. Please refer to the Beamline Wiki for more detailed information. This provides a consistent background as loading samples without moving the capillary ensures the most consistent possible background. Output from size exclusion chromatography may also be routed directly through the capillary to allow data collection as samples are run on a chromatography column using a coflow system. For more information on coflow please check the Kirby N. et al. (2016) Acta Crystallographica Section D72 (12) publication and the Beamline Wiki. 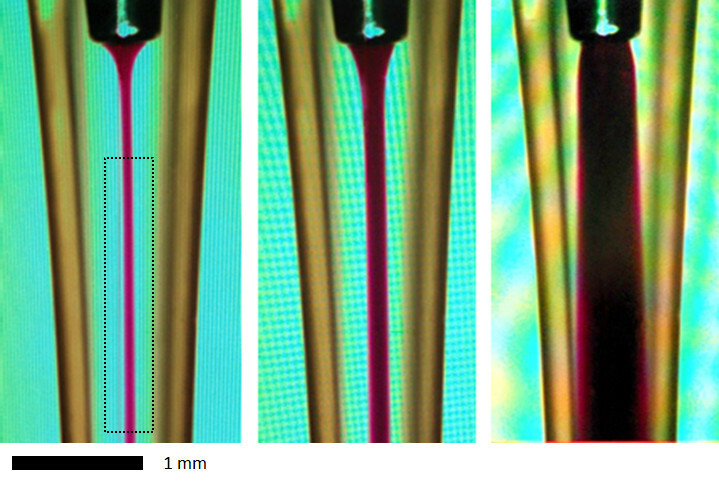 Schematic representation of the coflow cell (A) and visual demonstration of stable laminar flow in the coflow cell using a dye solution as a sample and water as a sheath flow (B). Gel and paste samples may either be run using a flat plate sample holder or an adapter plate attached to the heating/cooling block of the multi-capillary stage. Two duplicate plates are available to allow samples to be loaded in one holder while they are run in the other. Holes in the sample plate are covered with Kapton tape or film to hold the samples. Samples are loaded manually by covering one side of the holes, loading samples and then covering the other side of the hole to provide a sealed holder. Users should note that this manual sample loading requires considerable time and samples should be loaded in advance, with users arriving a day in advance of their beam time if necessary. Gel Plate sample holder which may be attached to heating/cooling block and mounted on the SAXS beamline. Two sample holders are also available to hold standard multi-well plates for transmission samples, more details of which are on the Beamline Wiki. This sample mounting method allows very high sample throughput but requires careful planning in sample preparation. As the x-ray beam passes directly through the plates there is a significant background due to scattering from the plastic of the plates. However, for strongly scattering samples or samples featuring diffraction rings the signal is acceptable. For suitable samples running 96 or 384 well plates on the beamline allows for many hundreds of samples to be run during an experiment. The sample table is flexible enough to mount many different pieces of equipment and sample environments. Rotation stages, syringe pumps, capillary mounts and temperature-controlled stages (using a water bath or electric strip heaters) are among the equipment available at the beamline. Some additional information and specifications are provided below, please refer to the Beamline Wiki for more detailed information. Specialised sample environments or stages, e.g. high pressure cells, furnace stages, magnetic stages, are not readily available and must be provided by the user. In such cases please read the Bringing Your Own Sample Mount section of the Beamline Wiki. Temperature monitoring is performed using K-type thermocouples and a Lakeshore Model 340 temperature control unit connected to the local network. A temperature-controlled stage is available for capillary-mounted samples which uses a recirculating water bath for a temperature range of 0 - 70°C. A temperature controlled stage is also available for transmission multi-well plates with a temperature range of 15 - 60°C. For more information on these temperature controlled stages, please refer to the Beamline Wiki. Linear stages may be readily installed at the sample position to provide motion independent of the sample stage and may be adapted for use as a syringe pump if required. A couple of rotation stages are available at the beamline in addition to a range of manual and driven linear stages. A single axis rotation stage and a two circle goniometer, detailed below, are also available for use at the sample position. As these stages take longer to install at the sample position, please notify staff of your requirements prior to your experiment. Huber 5203.20 two circle segment goniometer: two axes of rotation; 18° range (upper axis), 15° range (lower axis); 15" precision/accuracy; rotation centre 170 mm above top plate. A gas bottle rack is provided outside the experimental hutch with lines running to an outlet station inside the hutch for gases that may be required for experiments. An oxygen monitor is installed in the hutch to ensure a safe environment if non-toxic gases are in use. Lines are available for nitrogen, helium and inert gases. Users are requested to provide the gases required for an experiment and must contact beamline staff if requesting the Australian Synchrotron to provide the gases. Please note that the beamline is not capable of handling toxic gases at this time. If you intend to bring bottled gas onsite this must be advised in the Experiment Authorisation form at least two weeks before the experiment. Compressed air lines are also installed in the experimental hutch and are available for use during user experiments. The compressed air supply is maintained at around 600 bar although this can be adjusted if required. Some tubing is available for gas & compressed air lines. However, to ensure compatibility, users are encouraged to bring tubing for any equipment brought on site. The SAXS / WAXS beamline has a good record of being able to accommodate all equipment and sample mounts brought by users for experiments. Please refer to the Bringing Your Own Sample Mount section of the Beamline Wiki for detailed information and requirements. Miscellaneous equipment must be included on the Detailed Experiment Plan form submitted prior to an experiment and should be also discussed in advance with beamline staff. Be aware that mounting and positioning miscellaneous equipment can take considerable time, particularly if these requirements are not clear prior to the experiment.